From a fish that lived over 200 year to immortal jellyfish, these creatures definitely discovered the Fountain of Youth. You likely have seen this fish in a local outdoor pond. Koi is a type of carp that was domesticated. The fish can have a variety of colors: white, black, red, blue, yellow and cream. Koi is known to be released into the wild in many places around the world. Once in the nature they change their coloration to the color of common carp within a few generations. Longevity: 100 – 200 years. The oldest recorded koi, named “Hanako”, lived 226 years! Tortoises are known for their longevity and have one of the longest lifespans of any animal. Longevity: over 150 years. The longest recorded lifespan belongs to a tortoise that was presented to the Tongan royal family by Captain Cook in 1777. The tortoise lived 188 years. There is some evidence that tortoise Adwaita from Alipore Zoo in India lived 250 years! Greenland shark, also known as grey shark, lives in the North Atlantic and Arctic Ocean. This is one of the largest living species of a shark. It is similar in size to a great white shark. It is also known as one of the slowest swimming sharks, with an average cruising speed of 1.22 km/h (0.76 mph). In Iceland this shark’s meat is a delicacy and is known as Hakarl. It has strong smell and is poisonous when fresh. Longevity: The Greenland shark has the longest lifespan of all vertebrate species. Recent research shows that the oldest known shark lived for about 392 ± 120 years. That means this creature lived minimum 272 years and maximum 512 years! The Greenland shark is so slow growing that it reaches sexual maturity only at about 150 years old. The ocean quahog is an edible clam. It is common in North Atlantic Ocean and it is harvested commercially. Longevity: The oldest known clam, known as Ming, reached 507 years old. It was found off the northern coast of Iceland in 2006. Similar to the trees, the age of a clams can be determined from rings on their shells. Tuatara is a unique reptile living in New Zealand. It looks like a dinosaur. Tuatara is the only surviving member of its order, which disappeared 200 million years ago. Since 1895 tuatara is protected by law. However, they suffer from habitat loss and introduced to New Zealand predators, such as the Polynesia rat. Several zoos breed tuatara and release into the wild. Longevity: The average lifespan is 60 years. However, some experts believe that tuatara can live as long as 200 years. They live in Arctic waters and also known as Arctic Whales. Bowhead whale can grow up to 18 m (59 ft) and weigh up to 100 tons. These species have the largest mouth of all animals. At some point bowhead was close to extinction but thanks to conservation effort since 1966, the bowhead population has recovered. Longevity: This is the longest-living mammal. Bowhead’s lifespan is over 200 years. In 2007 whaling expedition discovered a whale with the head of an explosive harpoon on its body. The arrow-shaped object was manufactured around 1890. This animal survived a hunt over 100 years ago. The whale’s age was estimated at 211 years at least. 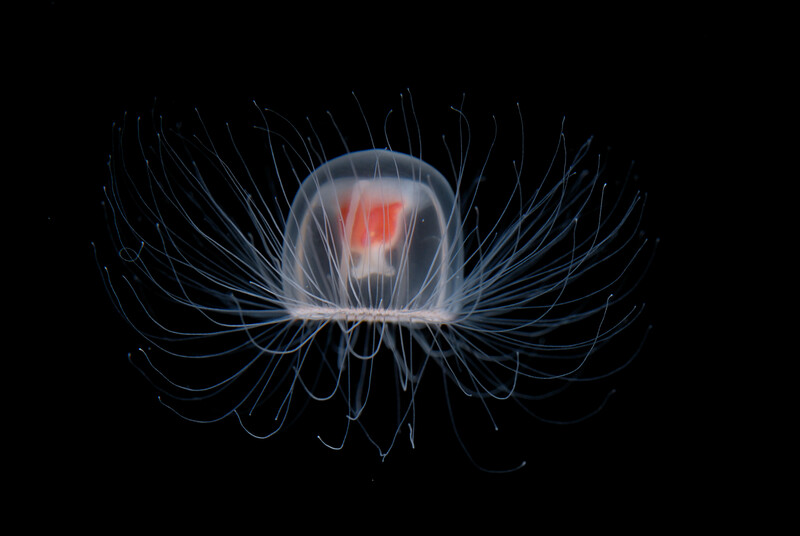 The immortal jellyfish is a small (5 millimeters or 0.2 in) species of jellyfish. It can be found in the Mediterranean Sea and around Japan. Longevity: The creature has the ability to reverting from adult stage to a sexually immature stage. Scientists are still puzzled whether the creature’s lifespan is unlimited. Laboratory research showed that 100% of specimens could revert its aging. However, in their natural habitat the immortal jellyfish has a lot of life hazards from numerous predators to disease.